The Connolly-Davis Band is ready to shamrock the house this Saturday. The place will be Riley’s Pour House, where we’ll be performing alongside The Wild Geese, Young John Gallagher, and the Danny McGoo Duo. 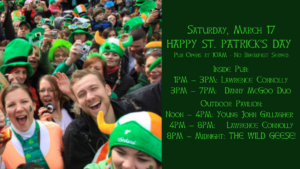 The music starts at Noon and continues nonstop on two stages until St. Patrick’s Day 2018 ends at midnight. Pittsburgh is famous for its St. Patrick’s Day celebrations, with niche.com ranking it the number-one place for March 17 festivities. Not surprisingly, there’s no shortage of places to catch Irish music music in Pittsburgh. You can read about some of them at CBS Pittsburgh, but for me the place to be is the pub that Sean Collier of Pittsburgh Magazine called “the most authentic Irish bar in or around Pittsburgh” — Riley’s Pout House. 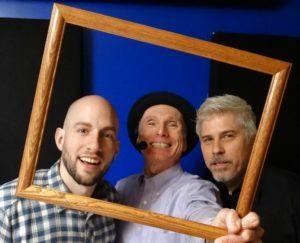 For this show, I’ll once again be joined by bassist Duane Davis, with whom I’ve been performing for going on 20 years, and drummer Pace Petrella. We’ll open with a two hour show on the pub stage at 1:00, then move outside at 4:00 to open for The Wild Geese Band, who will take the spotlight at 8:00. In all, it looks to be the best St. Pat’s ever. Come early, stay late, and get ready to shake your shamrock with some of the best people this side of the Blasket Islands. The Connolly-Davis Band. Framed! (Left to right) Pace Petrella, The 21st Century Scop, and Duane Davis. Promotional Banner for St. Patrick’s Day at Riley’s. The Connolly Davis at Riley’s, July 2017. This entry was posted on Wednesday, March 14th, 2018 at 6:29 pm and is filed under 21st-Century Scop. You can follow any responses to this entry through the RSS 2.0 feed. You can leave a response or trackback from your own site. Powered by WordPress and delivered in 0.227 seconds using 48 queries.